Former Dean of the Royal Postgraduate Medical School at the Hammersmith Hospital, London, and Professor of Medicine at the University of Newcastle upon Tyne died peacefully on 20th April 2014 after suffering Alzheimer's disease. Although David Kerr was born in Hackney, London, he came from a family with roots in the Scottish border country and was educated at George Watson's School in Edinburgh. He maintained strong links with Edinburgh studying medicine at the University of Edinburgh and qualifying MBChB with Honours in 1951. He undertook house physician and surgeon posts in Edinburgh and returned to Edinburgh after studying anatomy at the University of Wisconsin and gaining an MSc. After further postgraduate training in general medicine in Edinburgh he moved to the Hammersmith Hospital where he developed a special interest in liver disease. He worked with Professor Sheila Sherlock and during this time in a Lancet paper described the use of spironolactone, an antagonist of aldosterone, in the treatment of ascites in hepatic cirrhosis, this approach is still in use 56 years later. It was during this time at the Hammersmith that he met his future wife who was a sister on ward B1. In 1959 he moved to Newcastle as First Assistant to Professor George Smart to enhance his expertise in hepatology,but with the specific additional task of developing the then new specialty of nephrology. He was promoted to Senior Lecturer in Medicine and Consultant Physician at the Royal Victoria Infirmary in 1963, awarded a personal Chair in Medicine in 1968 and appointed Professor of Medicine in 1971. 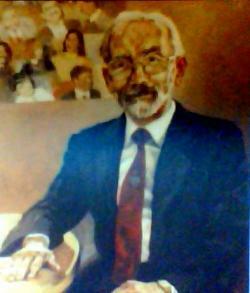 He moved back to the Hammersmith Hospital in 1983 as Dean of the Royal Postgraduate Medical School. In Newcastle his excellence in clinical work, teaching, research and personal relationships was quickly recognised. He set an example to the whole team with his personal dedication to the welfare of his patients and inspired loyalty in staff at all levels. He was one of the first in the UK to establish treatment of irreversible renal failure by long term dialysis and transplantation and with William Drukker and Stanley Shaldon one of the 3 founders of the European Dialysis and Transplant Association (EDTA). He was the first Editor-in-Chief of EDTA Proceedings serving from 1964 to 1970 and was President of the Congress of the EDTA in 1983. In 1986 he was only the sixth person to receive Honorary Membership of the European Renal Association/EDTA in its 23 years of existence. In the early days of dialysis, machines were cumbersome, difficult to set up and unreliable and the early disposable Kolff twin coil dialyser was prohibitively expensive. Lack of space also made hospital dialysis stations difficult to provide leading to a degree of rationing. David Kerr did not accept this and undertook a vigorous expansion of services by taking over a redundant ENT hospital as a large scale dialysis facility. He rapidly expanded home haemodialysis and later peritoneal dialysis. He also encouraged the development of independent renal units in District General Hospitals around the Northern Region. He developed a dedicated renal laboratory which dealt with both routine clinical biochemical analyses and research studies greatly facilitating his many epidemiological and laboratory studies. He undertook long term studies of reflux nephropathy, analgesic nephropathy, glomerulonephritis and renal transplant recipients. His main interest however was in the problems arising in patients undergoing long term dialysis and transplantation, in particular that of bone disease. After several years of dialysis patients developed bone pain and fractures with features on bone biopsy and Xray of both osteomalacia and osteitis fibrosa. The introduction of 1,25 dihyroxy-cholecalciferol, by-passing the diseased kidneys impaired ability to activate vitamin D didn't help. The answer came when Kerr and his team noted that dialysis dementia, known to be due to aluminium deposition in the brain, was more common in patients who also had bone disease. Bone biopsy confirmed deposition of aluminium in ossification fronts. The source of aluminium was the public water supply in Newcastle, to which it had been added to remove the brown pigment picked up from the peat in the moorland in its drainage area. Treatment of water for dialysis by deionisation and reverse osmosis to remove aluminium solved the problem. In addition to his academic activities David remained committed to his patients and even now, 30 years since he left Newcastle, patients express their gratitude for his care. He supervised many research fellows both British and international with special links with India, Sudan and Cameroon. With the support of his wife Eleanor he supported their social as well as professional lives and established lifelong bonds of friendship. David returned to Hammersmith as Dean of the Royal Postgrauate Medical School in 1983, serving in that role until 1991. He steered the RPMS through difficult times in terms of finance and governance, and was greatly liked and respected by staff at all levels. On his retirement, the article about his work in ‘The Special’ had the entirely apt title ‘In the pursuit of excellence - touched with humanity’. Even whilst Dean, David remained a clinician at heart and made a valuable contribution to the care of renal patients, including regular reviews of those on haemodialysis. He always found time to provide wise advice to colleagues in his various areas of interest. He remained a dedicated teacher and established the Diploma of Nephrology Course, which attracted students from across the world. Many of those went on to become leaders in nephrology in their own countries and kept in touch with him for many years after they left. Thoughout his life, David made major contributions to national academic life, which were recognised in 1991 when he was made CBE. In particular, he had a long and fruitful association with the Royal College of Physicians. He gave the Goulstonian (1968) and the Lumleian (1983) lectures, was Censor (1982 - 84) and Senior Censor (1990 - 91). He served as Editor of the College Journal 1994 - 98. He was President of the Renal Association from 1980 - 83, and Chairman of the National Kidney Research Fund (now Kidney Research UK) from 2000 - 2002. In the latter role he took a personal interest in the work of the fellows, and started the Annual Fellows Day which has remained the highlight of the year for the Charity. Kidney Research UK are about to launch a new Senior Clinical Fellowship in his honour. David was a man with a great Christian faith which guided all aspects of his life including his dealings with patients, staff and colleagues, without consideration for his own personal interests. He married Eleanor in 1961 and had a daughter and two sons who survive him. He enjoyed a happy family life and he and Eleanor were generous hosts to his local and international friends. It was a privilege to know David for all those came into contact with him.